END THE OPPRESSIONS! SHOW YOUR SOLIDARITY! in front of the UN Headquarters. anti-regime movement in two decades. Burma along with Iran and Tibet freedom movements. 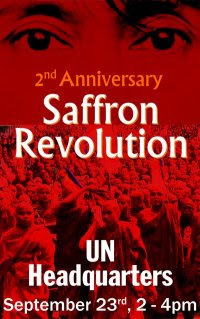 commemorate the Saffron anniversary will follow the rally. the 64th session of UN General Assembly.